Almost all the tomatoes are ripening well now and although a good number have been providing ripe fruits for a month or more, some of the large ones take life a bit more slowly. One of the last to ripen is the very weird ‘Reisetomate’ so I am going to start with that. I like oddly shaped tomatoes but I am afraid ‘Reisetomate’ took things a bit too far. I won’t be saving seeds of this one. This is the kind of tomato that only its mother could love – it is just so ugly. This German variety, which apparently translates as the ‘travellers’ tomato is thought to have been maintained for the way the fruits can be eaten without a knife – just breaking bits off. I can do that with a Toblerone too and it is a lot nicer. Baker Hill Seeds (which is where I get my American seeds) says the taste is strong and not great. I am doing my tasting as I write, with a bit of Dubliner Cheddar and I have to say that it tastes OK – the tomato, not the cheese! Not sour or nasty and the skin is not plastic either. But I can’t say this one is worth growing. Trusses are odd and so is the growth habit. And imagine the water collecting in all those ridges on the fruits and the mould setting in! 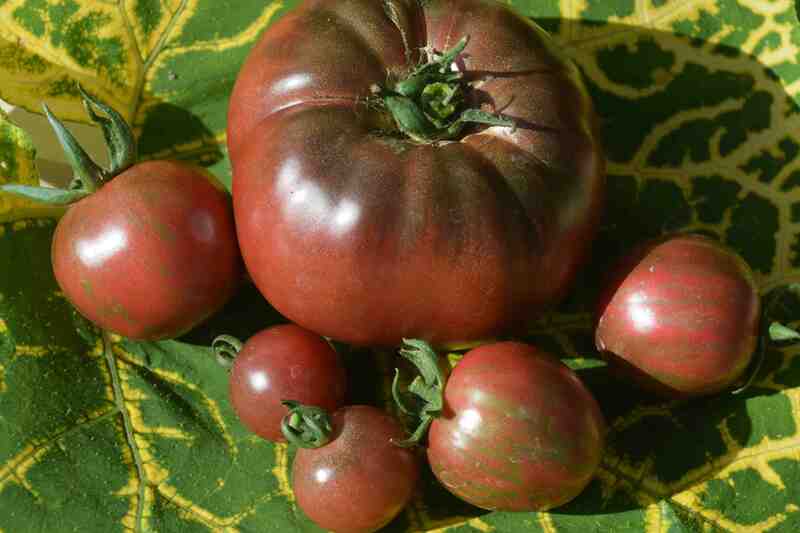 In general I like purple/black tomatoes and not just because they look so beautiful. We have a trio here. 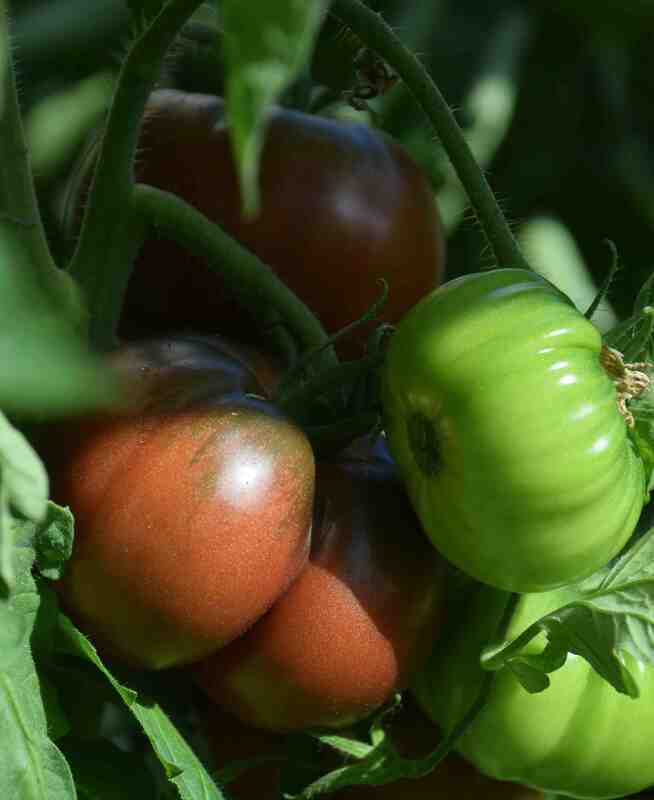 ‘Black Russian’ is a great variety with good crops of large fruits that just look beautiful. The one in the photo weighs 350gm and that is a good average among the larger fruits. The taste is quite rich and although at first it is rather mild and watery it develops in the mouth with a nice acidity at the end. ‘Black Vernissage’ is a new one on me but it has grown very well and has produced lots of the golf-ball sized dark fruits striped with green. This was given as a free packet by Baker Hill and their website has various reviews of it. I am not that impressed. The soft flesh is rather mealy and not that tasty. In addition the skin is very thick and has a taste of its own. I wouldn’t write this off but it is not a favourite for taste. ‘Rosella’ is a widely available purple cherry and it has large, branching trusses with lots of small, pretty fruits. Seed catalogues get quite excited about this one with taste descriptions mentioning various fruits. The tomatoes are rather firm but boy do they taste sweet. They really could be compared with raspberries etc and these are really great. I will have to compare them with ‘Sungold’ to see which is the sweeter but already this one is a winner and it will be on the seed list next year. I recommend it. ‘Brandy Boy’ is a large fruited hybrid and I assume it is an F1 hybrid though I am not sure. It has a good crop of pinkish red, juicy fruits that may need more sun than I can give them because although they are OK they are not outstanding. But they are not bad and the plants have cropped well. The skins are thin, which is a good feature. I actually like this one and have been munching on it with cheese. This one is a bit of an interesting one. Although called ‘Amish Paste’ it is said not to be a real paste or cooking tomato. 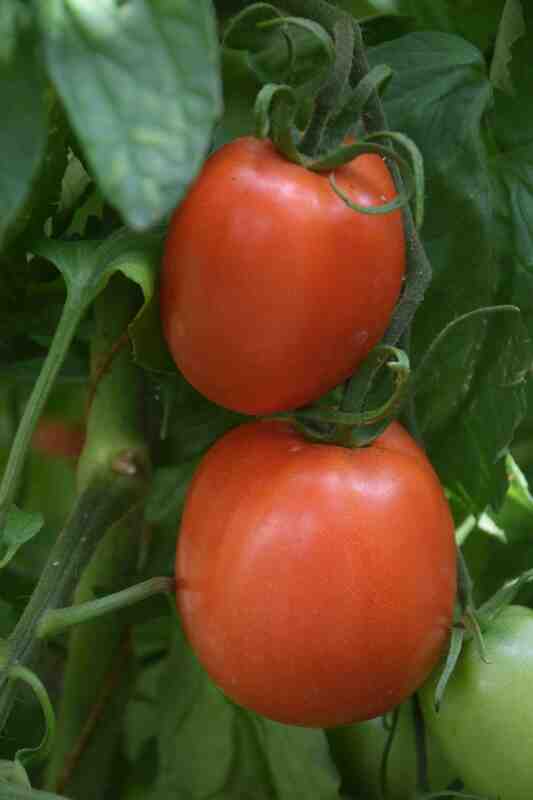 In my opinion it is too wet and soft to be a good paste tomato so I would say it is good for eating fresh. It isn’t the tastiest tomato but it is quite nice and the juicy flesh is mild and not overly sweet. If the crop was poor I would say this is of questionable value but it has done pretty well. 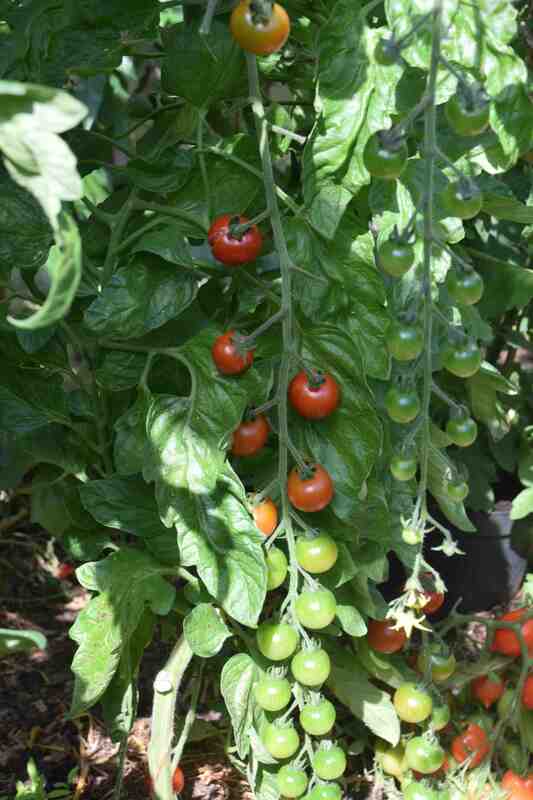 My plants all have the fruits that are typical of the variety – longer than wide. But I know this seems to vary and some stocks have wide fruits. 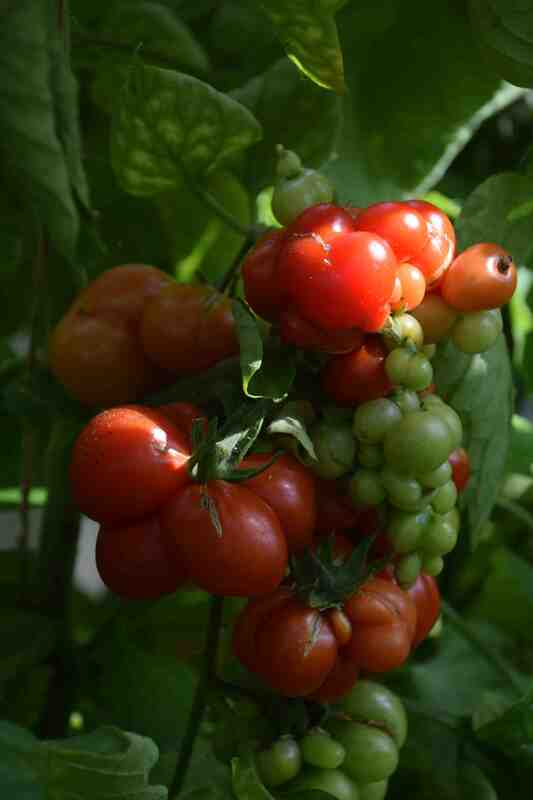 ‘Cherrola’ F1 is one of the many cherry tomatoes in the greenhouse this year and it is a good one. But it is not just the bright red, tasty, sweet fruits that have impressed me but the trusses that just go on and on! I need to measure them but they must be in excess of 70cm. One negative is that the ripe fruits do split a bit too readily – as you can see in the photo. Do not store them in the fridge – it spoils the flavour. Do not wash them until you are ready to eat them – when the skins get wet it makes them split. that’s good news. had to dig all the spuds yesterday because blight hit them. All safely in now. A day late and a dollar short, but I finally got to find out about your Reisetomate. Very interesting! I think I may have to try Black Russian. It looks and sounds like a really interesting variety. And from what I’ve seen, yes that’s the generally normal look of an Amish Paste. So far this year I think Amish Paste has been my favorite new discovery. (always a day late and a dollar short, I guess). I haven’t tried eating them fresh yet, but they’ve been great for sauces and canning. Like Romas on steroids without the steroids. 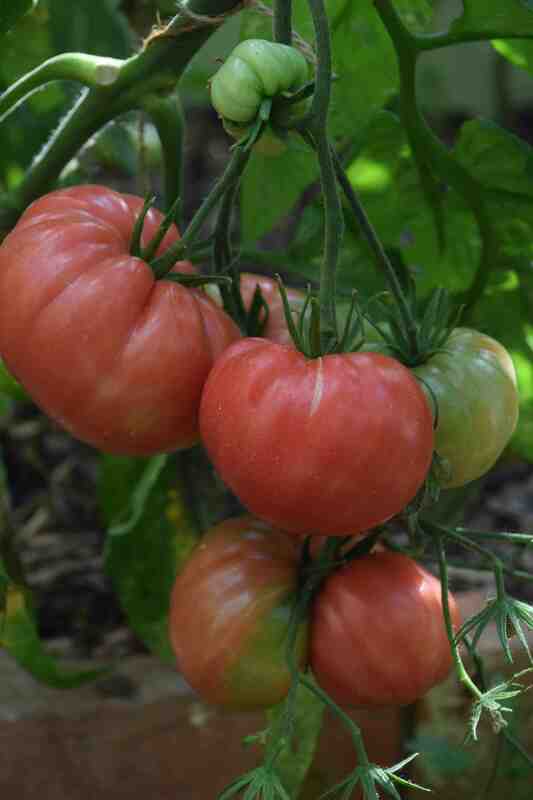 Great tomato reviews and wonderful images, as always Geoff! I’ve only grown it this one year, so it’s not a real test yet. But I do plan on doubling up on Amish paste next year and eliminating Opalka, which I wasn’t real impressed with as a paste tomato.